Our goal is to offer the BEST retail repair tech team in the Twin Cities! Welcome!! 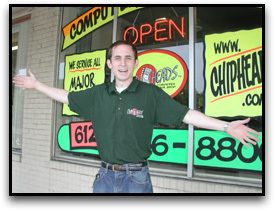 Chipheads Computer Repair Shop is the premier independent retail repair service in the Twin Cities. We are looking for experienced techs or tech managers to work in our St. Paul and Minneapolis locations. Duties include greeting customers over the phone, checking in and checking out systems for repair, diagnosis and repair of any problem, PC or Mac. Are you able to completely disassemble and reassemble all brands of laptop computers? Are you willing and able to contribute to the upkeep and cleanliness of our spaces? Do you want to break free of your cubicle and work in a cool shop? You must be capable of scheduling and performing on site service calls in customer homes and places of business. Most importantly, you need to be capable through your appearance, communication skills, personality and confidence of contributing to a positive experience for every single Chipheads customer. To better assist us in assessing your qualifications we request you download and fill out the following questionnaire. The questionnaire gives us a better idea of your background and will give you a better idea of what we are looking for. If you do not know an answer, feel free to research it, but please indicate that you have researched the answer. LOVE computers, most likely on the internet at all times, playing lots of online computer games, figuring out how to stripe their RAID setup. Is available for full time or part time work, between the hours of 8am to 7pm and 9-5 Saturdays. Truly enjoys helping people and solving problems! !